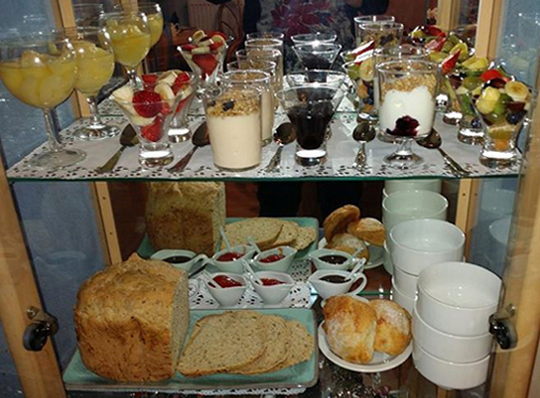 Here at the Kensington we pride ourselves on our fabulous award-winning breakfast. We go the extra mile with our menu, offering a traditional Full English Breakfast of sausages, bacon, eggs, tomatoes, mushrooms, hash browns, black pudding etc. We also offer a choice of omelettes and bagels, and many other delicious options to set you up for the day. Our breakfast menu also includes a good selection of Vegan and Vegetarian alternatives, such as our own home-made granola and chocolate pancakes and brownies. We make a conscious effort to use locally-sourced produce, and we serve our own home-made jams and marmalades, along with a selection of cereals, fresh fruit and yoghurts etc. 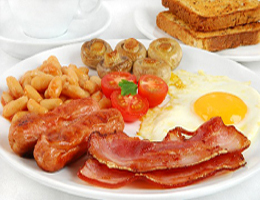 Our breakfasts are all freshly cooked to order and served in our comfortable and cheery dining room. We are happy to cater for special dietary needs or preferences - just let us know your requirements at the time of booking.